Brokers and insurers are rallying round policyholders affected by the NSW bushfires as the claim numbers reach 987 and insurance losses hit $128m. Speaking with Insurance Business, insurers said they had received several personal and commercial claims from policyholders and were working hard to look after their clients. Suncorp Commercial’s executive general manager for commercial claims, Matt Pearson said: “Following the bushfires, several Vero claims have been received for both personal and commercial policies. A spokesman added that it would be a few days before the industry can ascertain the extent of property damage as many areas are still inaccessible, once they are safe to enter, Suncorp will have a better idea of the financial costs of the fires. A spokeswoman for Wesfarmers, speaking on behalf of Lumley, Coles Insurance, WFI and OAMPS said its businesses had received roughly ten claims each covering home, contents and motor – but primarily property. This comes as the threat of a 'mega fire' in Blue Mountains subsided. There were fears that three fires would merge together to become one massive blaze but just hours ago NSW fire service commissioner Shane Fitzsimmons said it was safe for residents to return home. 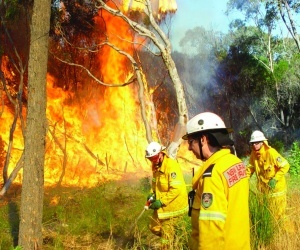 Paul George, managing director of MGA Insurance Brokers which has three offices in NSW, said there were fires around Lake Macquarie but MGA clients’ properties had not been affected by the NSW fires at this stage. In Victoria, residents in Ararat were yesterday battling through their own catastrophe in the form of a ‘mini- tornado’. It is reported that a number of homes were affected and power lines went down. A spokeswoman for Wesfarmers said that OAMPS immediately identified and contacted its clients in that area to provide them with assistance. Have your policyholders been affected by the catastrophes? Leave your comments below.